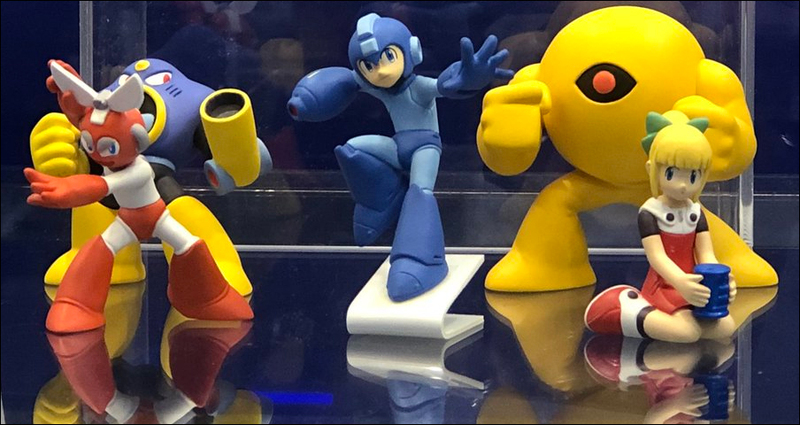 The next wave of Takara Tomy Rockman Figure Collection was shown on display at this year's Tokyo Game Show. Five all-new figures will go on sale starting January 2019 for 300 yen a piece. The previous collection was released earlier in 2017 – it featured Rockman in 3 different poses, Eddie, a Metall, and Dr.Wily. Air Man and Yellow Devil look pretty good. The others look a little too cheap to display. I need cutman and airman. Nice and all but I dont need them. I prefer to collect the physical video games and guide books. Art is my top collection. Perfect for me. He was never a favorite of mine in the game, but it seems like Air Man figures always look so cool. Eddie was the best thing about the 1st wave of these figures; he scales quite well with the Sentinel and D-Arts Rockman figures, and he's got a little E-Tank hiding inside his hatch. These are roughly $2.67 USD. I might get all of these. Nice figs and cute poses. I'm a bit surprised it's Air Man and Cut Man again, since they were both in the Super Modelling Soul series. I guess they're super popular...?